Apple and Samsung both have hardware for facial recognition of users that are being used for animoji -- and AppleInsider compares the two systems. Apple introduced their TrueDepth camera system to the world with the release of the iPhone X. It houses an array of sophisticated sensors that work together to achieve an extremely precise 3D map of a users face. So precise that they're using it as the main authentication method on the iPhone X, claiming it to be 20x more secure than Touch ID. Samsung on the other hand, has just released their S9 and S9 Plus flagship phones, which unfortunately lack any kind of new sophisticated 3D camera system. Their new Intelligent Scan unlock feature isn't really anything new, it just combines the old Face Unlock and Iris Scanning. On top of that, you can't even use Samsung Pay with Intelligent Scan, showing Samsungs lack of confidence in it security. We compare it to Apple's Face ID in this video, and it seems like Samsung is just trying to hold out until they can develop their own 3D sensing camera system. Samsung also released their new AR emoji, and it seems like a last-minute, temporary solution in order to keep up with the iPhone X's Animoji feature. Before we get into the comparison, let us quickly explain why Animoji is so advanced in the world of facial animation. Some animated movies have extremely realistic facial expressions, and if you look behind the scenes, many times, they'll either draw dots or place small spheres onto an actor's face. When they change facial expressions, the dots move around, and a camera or sensor mounted in front of their face will capture the motion of the dots, allowing them to create extremely realistic facial animations. The TrueDepth camera system works pretty much the same way, except it projects thousands of infrared dots, which are invisible to the naked eye so they don't distract you or anyone else. While using Animoji, the TrueDepth system scans the depth and distances between the dots to create a 3D facial depth map, which is then mapped onto the RGB camera to track movement. The iPhone X's A11 bionic processor then renders the animations in real time. Apple has 16 different Animoji characters to choose from. AR Emoji starts with 4, including your own personalized Emoji, but you can also download various character packs like Mickey & Minnie Mouse. The rest of them are just stickers, similar to what you'd find on snapchat, but to be honest, Snapchat's stickers are superior. Third-party apps like Snapchat can utilize the iPhone X's TrueDepth Camera system, so facial tracking is a lot more accurate and natural compared to other devices like the S9 Plus. When using AR Emoji, you can see the stickers lag behind. They almost look like they're floating. They even completely disappear if you turn your face too far, which won't happen using Snapchat. Comparing Animoji to AR Emoji's characters, you can see that the eyes are fixed on a central location while using the Samsung Galaxy S9, but the iPhone X can accurately track the motion of your eyes. However, the S9+ is better at keeping one eye closed. For some reason, the eye you close can twitch while using Animoji. If you close both eyes and open one eye, Animoji sometimes opens both eyes at the same time. You can also easily see how much more fluid the Animoji animations are compared to AR Emoji, which look a bit choppy. There's also a small amount of lag between you changing expressions and them showing up on the screen. With Animoji, however, there's no lag at all. While speaking, Animoji does a better job at syncing the lips with your words. Samsung's camera app sometimes crashes while using AR Emoji, so hopefully they'll have a fix for that coming soon. AR Emoji characters are also static, lacking any kind of ragdoll physics. For example, look at the lions hair flowing around as I move my face side to side. With AR Emoji, everything is completely static. Animoji tends to stay centered, while AR Emoji moves the character around the screen while you move, so that could be a plus as well. Animoji looks more natural and expressive. While smiling, AR Emoji honestly looks a bit creepy, no matter which Emoji you use. Look at the lack of difference between having a sad face, a blank face and smiling using AR Emoji. Animoji accurately portrays happiness through the eyes, cheeks and smile, and it actually looks joyful and pleasant. Animoji also does a great job of showing anger compared to AR Emoji. Recordings while using Animoji are limited to 10 seconds, which you can then send to friends. If that's not long enough for you, you can use Apple's built-in screen recording feature, which can record audio as well. AR Emoji recording isn't limited, so that's a plus for Samsung. In conclusion, the technology behind Animoji is far ahead of Samsung's AR Emoji. It's more accurate, fluid, expressive, and much better animated. Samsung does have the upper hand in personalization, with the ability to create a custom Emoji that mostly looks like you and can be implemented into GIFs that can be sent to friends. The implementation and fluidity of stickers is just horrible, especially when compared to Snapchat. Hopefully Samsung has some kind of 3D sensing camera system in the works, because without a sensing system refresh AR Emoji just won't cut it. As usual, Scamsung just comes out with another rushed, copied (and very poorly at that) Apple knockoff so they can put it on a spec sheet and claim "We have it, and it's better", when that couldn't be furthest from the truth! Considering that Apple has a close relationship with Disney, I’m surprised that they licenced Mickey Mouse to Samsung. Unless it’s another rip off. Nicky Mouse perhaps. Well, looking at the S9 AR capabilities, just one video clip came to my mind: "Money for Nothing"
Twenty times more secure than Touch ID. Unless you have a twin, in which case it’s less secure. btw Samsung’s AR emoji looks like cow manure. Vadim, I really appreciate that you allowed to see that horrible ARmoji of "you" (it looks nothing like you -- more like Gilbert Gottfried really!) and didn't immediately delete it out of sheer horror. 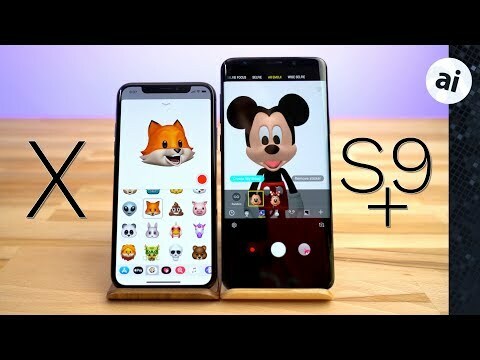 This video should be required viewing for anyone thinking of buying either of these two flagship phones primarily for the animoji/ARmoji feature (and trust me, you guys -- that's way more people than you might think). Animoji is clearly one of the most visible ways to show people that the iPhone X overall is the superior product, especially from that the emoji/messaging perspective.